ZBrush has an impressive set of retopology tools that will allow you to quickly convert a high density mesh into a low density mesh while maintaining detail. We will largely use these for automating the process of remeshing. 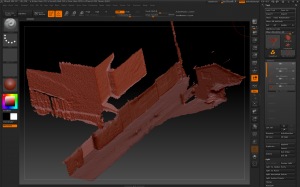 We will also go into detail on how to clean up any unwanted sections of the mesh. 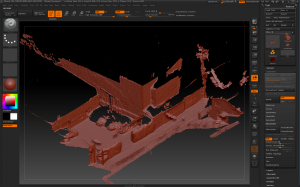 We will be bringing in our OBJ file from Agisoft Photoscan, and remeshing with ZRemesher. 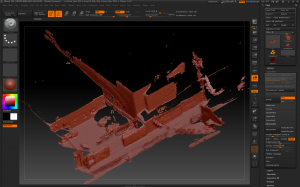 Click the import button on the Tool menu, and open the OBJ file from Photoscan. This will load your model to what is called a ZTool. To bring your ZTool into the workspace, Right click in the workspace and drag to the side, it does not matter how large the model gets because you can zoom in later. After you have done the first click and drag, don’t click and drag again, just hit T on the keyboard. This will put it in edit mode and you’ll be able to move around and look at the model. To remesh, open the drop down for Geometry. Open the sub drop down, ZRemesher, and adjust the settings to use Same or Half resolution, and turn Adapt off. After you have chosen those settings, click the ZRemesher button. It will take a few minutes to fully compute. Note: If a Half or Same resolution remesh fails, turn on Adapt and adjust the Target Polygons Count to max and the Adaptive Size to max. 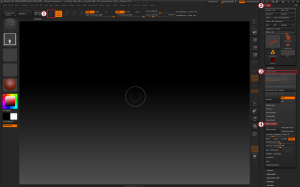 To cleanup unwanted areas of the mesh, you can use ZBrush’s simple tools. Using Shift+Ctrl+Alt with click and drag, you can select around polygons to hide. After hiding polygons, then go to the Geometry drop down, to the Modify Topology sub menu. Hit Del Hidden to delete the unwanted geometry. 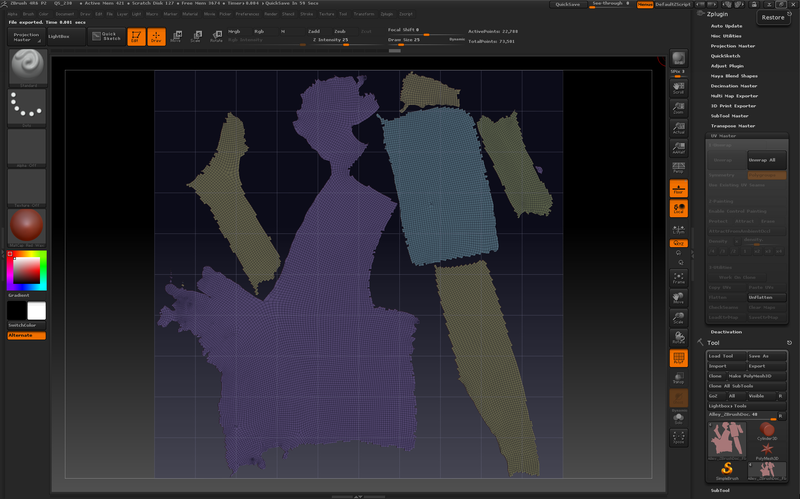 Since Photoscan can automatically unwrap UVs, there is the option to unwrap prior to bringing back into Photoscan. This can help with determining what resolution certain areas will receive. UVs can be unwrapped using the plugin called UV Master. Start by breaking down the scene into smaller chunks, called “SubTools.” The SubTool menu can be found in the Tool Menu. To break down the scene, start by masking out areas using Ctrl+LMB, either painting the mask on the object or making a large selection by starting off of the object. To remove mask sections just hold Ctrl+Alt+LMB, and to clear either use Ctrl+LMB and select outside of the object or use Clear from the Masking menu. 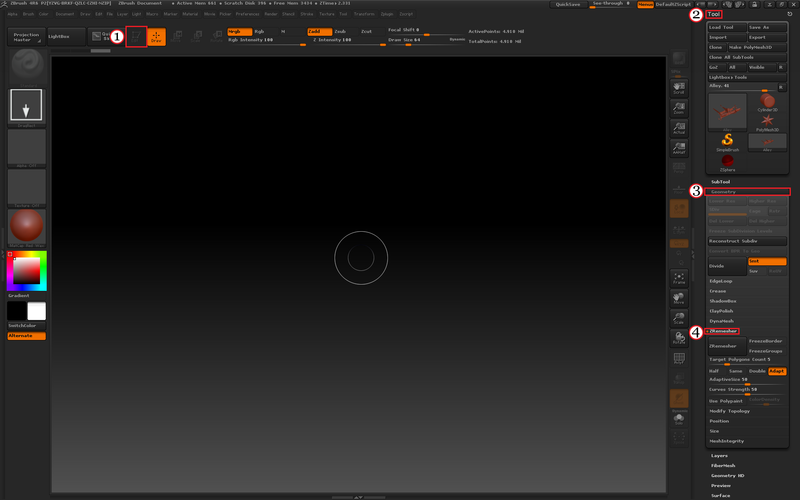 After you’ve selected a masking area, open the SubTool menu and the Split sub menu. 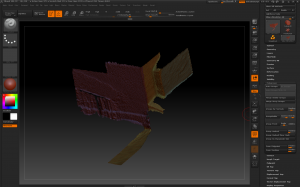 To break up the object select Split Masked Point, do this until the object is broken up to your liking. Keep in mind the size of object that is going to be projected to UVs. Make sure you rename the objects, or they will not export correctly. Next, you’ll want to create polygroups for each subtool. The Polygroups menu is also in the Tools menu. This operation works similarly to breaking up Subtools. Mask out sections you want to break into polygroups, then go to the Polygroups menu and select Group Masked. Continue this to break up the UVs along seams. When polygroups are completed, it’s time to move on to UV Master. Disable all options other than Polygroups, since that’s what information we’ll be using to unwrap UVs. Select Unwrap, the computer will take a few seconds to complete to UV set. To view the UVs, select Flatten from the UV Master menu. If the UVs look good, UnFlatten the SubTool. When completed with the remeshing and cleanup, export the scene back to OBJ. This scene can be brought back into Photoscan for texture reprojection. 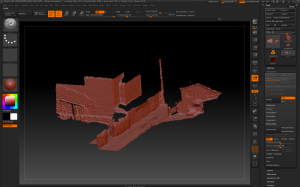 If you use ZBrush for UVs, use the GoZ function for All, and port the scene over to Maya. Once it’s in Maya, re-export it again as an OBJ for Photoscan.